The plasma physics community will have access to a dedicated ion beamline in the APPA cave. The cave, whose layout is shown in the figure below, will be 1064 m2 large and its will be supplemented by the 650 m2 of the supply building. In addition to the plasma physics community, the cave hosts experiments from the SPARC and BIOMAT collaborations. 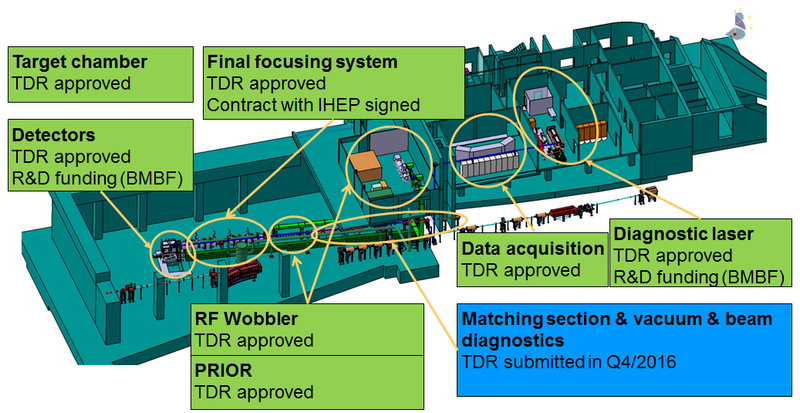 The 50 m long ion beamline is designed as a multi-use ion beamline to enable employing the proton microscope PRIOR and the other schemes proposed by the community like HIHEX and LAPLAS. The ion beamline location can be seen in the general cave scheme above, while a detailed view of the beamline is shown below. 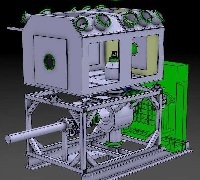 The ion beamline is made of the matching section, a free space to be used by the various schemes, the focusing magnets and the target chamber as depicted below. The work packages follow the FAIR nomenclature and concern sub-systems of the beamline installation. Below is a list of the plasma physics technical work packages. The work packages are described by technical design reports written by the collaboration and approved by the FAIR Expert Committee Experiments (ECE). TDR: "Beam matching section with normal-conducting quadrupoles in the plasma physics beamline in the APPA cave at FAIR - including beam diagnostics and the vacuum system"
TDR: "Large-aperture high-gradient superconducting quadrupoles for HEDgeHOB experiments"
TDR: "The RF multi-cell deflector (wobbler) for LAPLAS experiment"
TDR: "Proton microscope for FAIR"
TDR: "Design, construction and commissioning of a target chamber for ion beam driven interaction experiments"
TDR: "Diagnostic instrumentation for plasma physics experiments at the APPA cave"
TDR: "Laser-based pump-probe equipment for the APPA cave at FAIR"
TDR: "The supervisory control and data acquisition (SCADA) system for plasma physics experiments for FAIR"